If Michael Pollan’s recent celebrity is any indication of the national mood, then one might expect a plethora of options from which to buy locally sourced and organic food. 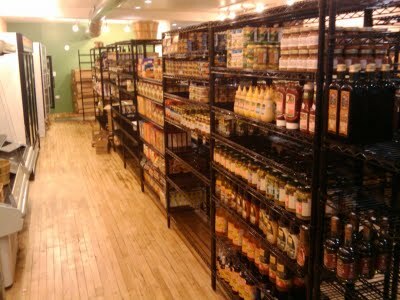 But while the corporate options like Whole Foods and Trader Joes are firmly established in Chicago, each with multiple locations throughout the city and suburbs, small, community markets are rare, and currently only Dill Pickle Food Cooperative can claim the title of local food co-op since the long-running Hyde Park Co-op closed several years ago due to financial strains. Getting started was no easy task either. General manager Vinnie Hernandez mentions that it took five years to build a functioning organization from the time that DPFC founder Kath Duffy sent out her initial application to the community for support. Nevertheless, the DPFC, which just celebrated the first anniversary of its opening, was entirely funded by individual member loans. Hernandez calls this circumstance “an aberration,” citing that with co-ops, “there’s always a bank issue.” The groundswell of financial support is especially remarkable when considering that it took place in the midst of a serious economic recession. There are plenty of reasons why the DPFC should not have survived its first winter, much less its first year. The food co-op has an emphasis on locally grown food, with approximately 78 percent of its product coming from small farms in Illinois or an adjacent state, and 62 percent of products being certified organic. In both cases the consumer must pay a premium. And in the case of local produce, selection becomes necessarily limited in the winter months, which can discourage customers who are used to enjoying the full spectrum of nature’s cornucopia any time of year. So why does Hernandez think that the DPFC was able to survive? For one thing, its location, in Logan Square, is on the edge of a food desert, a term which has come to describe communities which are underserved by grocers. Hernandez says that before the DPFC there was nowhere for people in Logan Square to go to buy fresh produce.